*Entrance to drawing signs you up to receive monthly newsletter and offers. You may opt out any time. We will treat your home as if it were our own! This 1300 square foot basement was transformed to be a bright, lively, living space. The family added a living area with sofa and a television. Their 2 year old son has his own play area. The family moved their washing machine and dryer to this basement area as well, freeing up valuable space upstairs. The homeowner said the best part is there is "more room to enjoy their big family". This once well used laundry room was transformed into an apartment kitchenette to accommodate new use of the space. The Marshall Exteriors expert carpentry crew framed in the walls to create clean lines and doors to separate the room. Plumbing was reorganized for a small sink to be installed. The room now has functionality and is ready for the appliances for this new kitchenette. This creative homeowner was looking to convert her storage shed into a “sleeping cabin” for her beloved grandkids. She called the experts at Marshall Exteriors to help transform her once storage shed into a cabin. The Marshall Exteriors carpentry crew began by building in a frame on the portion of the shed that the lawnmower was parked. The rest of the structure needed framing in the interior to hold the walls, flooring and new VWD windows. A sub floor was also installed to allow for the tile flooring to be laid. After all the framing was complete, insulation covered the walls before the white paneling was installed.The exterior of the shed was wrapped in CertainTeed vinyl siding ‘white’ color, aluminum fascia and vinyl soffits. A Builders Choice entry door was added to the shed which was painted black to suite the color scheme. To complete this sheds transformation into a cabin black shutters and flower boxes were added. Very friendly, willing to work with you on what ever your needs are. Very pleased with the 1st contact, very welcoming. 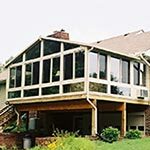 Marshall Exteriors is the trusted remodeler in New York, specializing in both interior and exterior home improvement solutions, such as roofing, basement finishing and remodeling, decking, replacement windows and doors, vinyl siding and gutters. 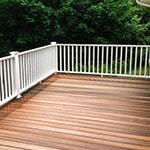 We install high-quality materials and products from the nation's leading manufacturers and provide strong warranties. We are also The Greater Finger Lakes Area's authorized Total Basement Finishing contractor. From simple roofing maintenance to major repairs and total remodeling, we're your expert for all your home improvement needs. Contact us today for a free design consultation and quote. The weather takes its toll on your roof and the exterior of your home, so sometimes repairs are necessary to keep your home safe and looking its best. When it comes to fixing and upgrading your roof and the outside of your home, you want to work with a company you can trust. From roof repair to new siding to replacement windows, our professionals are experienced in all types of exterior home improvements and can install products that better protect your home and make it look good too! When you need roof repairs or a roof replacement, our professional contractors will do the job right. We are a fully insured roofing contractor and a factory-certified GAF Master Elite® contractor. Choosing Marshall Exteriors means that you will be fully satisfied with our services, leaving no other company better suited to handle your roofing and remodeling needs. The best, low cost way to add living space to your home is not by building an addition to your home but by finishing the basement. 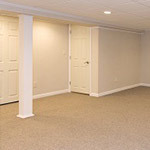 With the Total Basement Finishing, we can give you an attractive, finished space that is also warrantied and waterproof. Whether it's a home office or gym, a play area for the kids or a place for the adults to relax, we can create a comfortable living area where your family will love spending time! 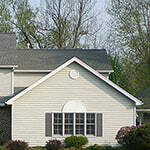 Ready to get started on your roof repair or home remodeling project? Contact us today to request your no-obligation consultation and free estimate. 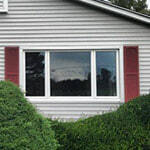 We service homes in Fairport, Canandaigua, Geneva, Newark, as well as Victor, Ontario, Seneca Falls, Waterloo, Farmington, Macedon and nearby. Learn more about owner Adam Olschewske, recently featured in Roofing Contractor Magazine!